This week I am joined by Donny Yankellow (@rtteachr) and Warren Sklar (from the Mac to the Future Go Livecast) to discuss the news. We had an i9 “disaster” that wasn’t, and rumours that the T2 may be causing issues. But we think that was old news and a “storm in a teacup” and so we wander off into a variety of far more interesting things. 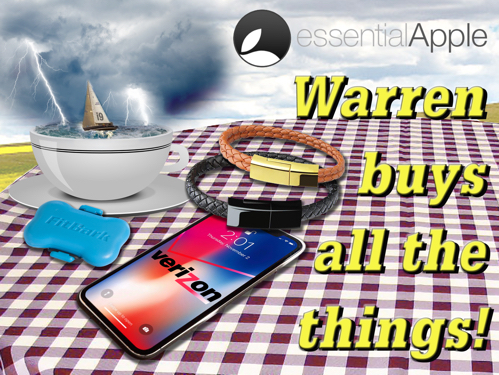 Like the sales spike in Apple Watches, FitBark Dog Activity Trackers, Verizon’s VPN, and the AnyFont App for iOS. Bsolli Plaited Leather Lightning Charge Cable Bracelet – Amazon £12 UK 2 sizes, available in black, or brown and gold. USB C and Micro USB versions also available. Auzev in the US $16 US and again Micro USB and USB C versions available.